While much of the wearables focus remains on the upcoming Apple Watch launch, Pebble continues to push forward with its own smartwatch platform that began as a record-setting Kickstarter project and has blossomed into a successful company. Pebble CEO Eric Migicovsky recently discussed the company's extensive plans for new hardware in the upcoming year, along with a few details of Pebble's prosperous 2014, in an interview with The Verge. Reaching a milestone for the company, Pebble shipped its one millionth Pebble smartwatch on December 31, 2014, undoubtedly thanks to a few major price drops to its flagship products and the introduction of noteworthy apps onto the device last year. As The Verge points out, Pebble's biggest competitor in 2014 was Google's Android Wear device range, but both will be facing significant competition come this April when the Apple Watch launches to the public. Migicovsky is unfazed by the imminent release of the Apple Watch, however, outlining how Pebble's line of devices planned for release this year will deal less with the app-obsessed world most devices focus on, instead offering something dramatically different than any smartwatch on the market. "We’ve found a new framework to use as an interaction model on the watch," boasts Migicovsky, before adding that while apps will continue to exist on Pebble, they won't be the main focus of the platform. "It doesn't look like what we have today, and it doesn't look like what's on your smartphone." Migicovsky sticks mostly to pointing out Pebble's successful year - such as the company more than doubling by year's end its 400,000 units sold as of March - than providing meaningful details on new products coming out of the company. He tells The Verge fans will have to wait until "later this year" for more details on the company's upcoming devices. Pebble's unflinching attitude towards its upcoming war with the Apple Watch falls in line with previous actions the company has taken when it comes to Apple's new wearable. When Apple announced the Apple Watch last September, Pebble updated its website with a few related zingers - targeting battery life, price, and over-enthusiastic responses - aimed at its competitors, namely Apple. Yeah, good luck Pebble. With Apple around the corner and much better Android alternatives your days are numbered. You all doubled sales because you drastically lowered the price right when the Apple Watch was announced. Disagree... Apple Watch is priced too high for the average consumer for a satellite product like a smart watch... Pebble's $99 price point is spot on for a 2 year old product. The price drop is no different than Apple's price drop of their aging iPod Touch last year. You do realize this is as petty as Android and Windows fans calling Apple Products "toys" right? I used to think Apple fans were a little more mature than this... guess not when it comes to a watch that hasn't been released yet. Are Pebble's days numbers? Maybe. Maybe not. What Pebble has created is somewhat unique right now. Pretty good battery life. Low barrier of entry (price point). Plenty of features. And oh yes - it's cross-platform. While other watches might be nicer, they also come at the expense of price, battery life, and perhaps a lot of extras that some/many might not even want. I wouldn't rule the Pebble out yet. Smartest post on this thread! The Apple Watch will sell more on its first day than the Pebble will sell in the entire lifetime of the company past present and future. Good for them to stay positive and optimistic. But Apple watch hasn't launched yet. it could increase pebble sales for people looking apple watch alternative or they could be gone next year as apple watch become the giant in the category. they won't have as many functions nor will they have direct support from Apple or Google for first party features. Their best bet at this point is to partner with Blackberry and Microsoft to become the defacto smart watches of those devices since the Android and Apple Watches won't work with those devices. Pebble is lost. It's only a matter of time before they start on the slippery downslope. And they better be very worried about the Apple watch. Pebble is such a cheap, ugly toy. So much so that it won't even suffice as a budget alternative to the Apple Watch. Bye bye Pebble. I completely disagree. I'm confused why some posters here believe that anyone who wants a smart watch is going to fork over over $300 for one. I agree that FitBit is a major competitor. But Android Wear and Apple Watch? Birds of a different feather. Not everyone wants all the bells and whistles that Google and Apple are delivering. It's just that simple. Keep the price low and they will come. I have owned 4 pebble watches. 2 of the first gen plastic model and 2 pebbles of the 'steel' variety. I hate them. All of my Pebble watches have sucked. Software issues, first gen hardware issues, battery life fading. It is a matter of weeks before the thing fails to work enough it warrants a return. Their problem is they need to be replaced yearly. They are disposable. Cheap. Lacking consistent functionality without a glitch or restart needed. I have no idea what you are talking about.... I've had one since Christmas 2013 and only one time have I had to restart it and that was because my phone shut off when it was downloading new software onto the watch. I still to this day get between 4-7 days battery life. I'm not surprised that the Pebble is selling as well as it is. The Apple Watch is cool, but it's $250 more. Most people just aren't going to spend $350 on a watch. Most people don't even want to spend that much on a smartphone, much less a watch. Generally, people want to spend $20-$50 on a watch and leave it at that. 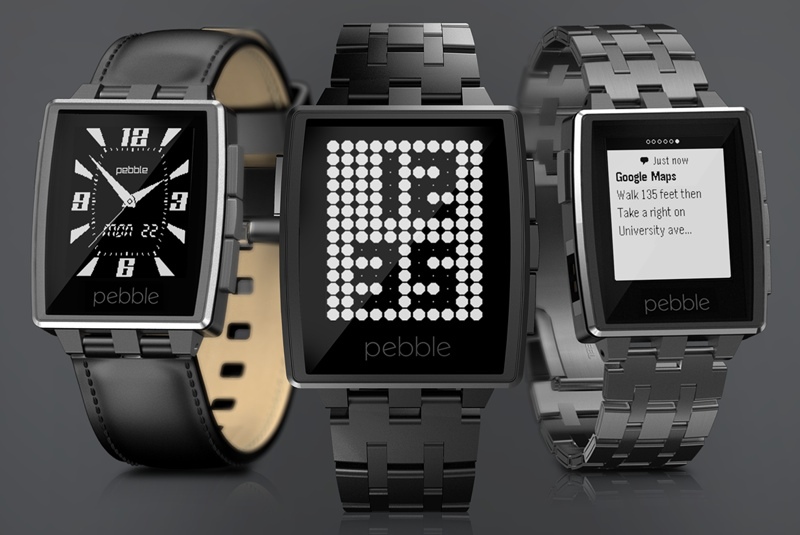 The Pebble is priced a lot more reasonably(and affordably) at $100. It's a lot easier to see spending $100 on a smartwatch than $350. Even though the $100 Pebble looks a little cheap, it serves the purpose of a smartwatch without being too expensive. At $350, the Apple Watch just isn't priced to sell. It'll sell, but most people won't buy one because it's far too expensive for its purpose. And don't get me wrong, I'm a big Apple guy; I realize I don't sound like it, complaining about the price. i just can't see spending $350 on a watch. I would have bought a Pebble except that it's so ugly. I was really close to backing it. I also didn't think that Apple would allow some of the notification features but was wrong about that. Then they brought out the "pretty" bands and I realized they just don't get it. Battery life and price is the only reason to get this watch. Luckily for Pebble, those are still some good reasons. I disagree with this article saying the Apple Watch will be a competitor of the Google Gear. I don't really see them competing directly. If you have iOS you get Apple Watch, if you have Android then you get Google Gear. It's about the platform you already have. Sure, over time having a better Watch might make your platform stronger, but you don't walk into a store and try to decide between the two unless you're replacing all of your tech at once. These ecosystems are becoming extremely entrenched.